Great snow, challenging terrain, 4,000 foot vertical drop . . . what more could you ask for? Since opening 40 years ago, Jackson Hole Mountain Resort has been every skier's dream come true. Any aspiring skier in the United States has heard of Jackson, and every season sees an influx of these skiers and snowboarders looking to live the dream. Read ‘em and weep – these numbers don't lie. The sheer amount of terrain at Jackson Hole Mountain Resort is daunting, and deciding where to start your day can be a challenge, even for locals. Here are a few tips to start you out, but those willing to explore the mountain and get a little lost will be rewarded. If you want some more guidance for where to go ski, hire a mountain guide to show you the goods. This long, intermediate groomer runs from the top of Apres Vous all the way back to the base area – a nice cruiser that's a great way to start out the day. Follow the Women's World Cup Downhill course from the top of Thunder 3,500 feet down to the base area. Rip these groomers without stopping are your legs are guaranteed to feel it. If you want more of this, follow Sundance down from the top of the Gondola. This area, at the far north end of the resort off of Apres Vous Lift, is a good spot for advanced skiers who w ant to avoid some of the heavier-crowded areas. You'll have to get creative to piece together the fun, short runs, but for those who enjoy the challenge is a nice out-of-the-way spot. This cirque contains expert-only, rocky chutes that attract skiers looking for terrain that will challenge their skiing and route-finding abilities. Although this area is in-bounds, carrying avalanche gear is a good idea. Access is through gates at the top of Gondola or Sublette. If you're an expert skier looking for tight, steep chutes, check out Tower Three Chute. This north facing chute drops off right underneath the Thunder lift and down into Amphitheater. Once it starts to get skied out maintaining speed without stopping becomes a fun challenge. When you're finished with Tower Three, drop into Alta Chutes, off of the Sublette Lift. The Tram is a signature part of Jackson Hole Mountain Resort, and nobody who comes here should leave without riding it at least once. Big Red, as it's been fondly dubbed, carries 100 skiers (101 with operator) 4,139 feet up in just 9 minutes, unloading at the top of Rendezvous Bowl, where you'll have the whole mountain beneath you. While Rendezvous Bowl is often wind-packed and skied-out, if you hit it on a powder day you'll realize there's no better place to be. The Tram is also the only way to access Corbet's Couloir. In 1960, when Barry Corbet first sighted a tight notch through the cliff band at the top of Jackson Hole he only said “Someday someone will ski that.” Today, Corbet's Couloir is known as “America's scariest ski slope” and attracts skiers from all over the United States who wish to prove their mettle on this famous run. While the runout of Corbet's isn't too different from any other expert run on the mountain, the entrance is what gives skiers pause. After sliding down a short ramp, the 10-30 foot mandatory drop spits skiers out heading straight for a rock wall, forcing a quick, hard right turn. The only way to avoid this quick drop-and-turn move is by heading straight off the top of Corbet's, turning the decent drop into a much larger fall before landing on the steep, ~50 degree slope. 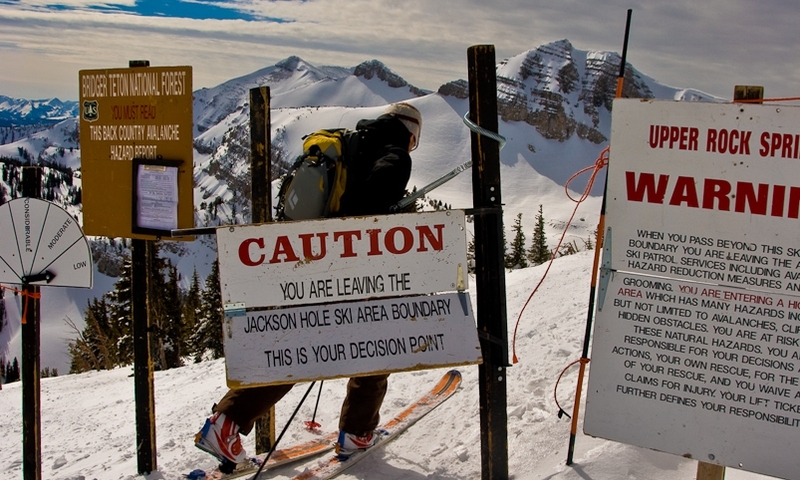 Part of Jackson Hole Mountain Resort's fame comes from its unsurpassed backcountry access. With gates they famously refuse to close that access over 3,000 acres in on of America's top mountain ranges for skiing, many skiers only use the resort as a way to lap Granite Canyon or gain a quick 4,000 feet before heading out on a tour. While Ski Patrol at Jackson always keeps their gates open, it is backcountry terrain and skiers leaving the resort boundaries should have and practice backcountry safety skills. 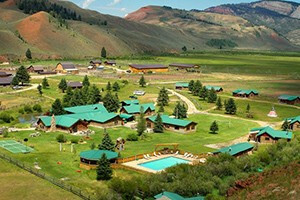 If you aren't comfortable leaving the resort on your own, guide services are available. 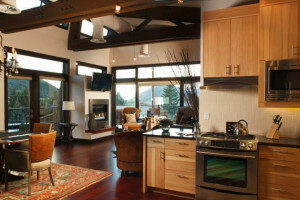 Jackson Hole Mountain Resort has a staggered opening beginning in the last week of November. This means that the first week or so of the season may only have a few groomed runs with man-made snow. If you're travelling into town to ski, you'll be better off waiting until late December, January or February, when more snow opens the rest of the mountain. The Resort closes in the first week of April amidst a non-stop party that includes locals and visitors alike. If you can be at the resort for closing weekend, and I recommend you try, you'll find yourself surrounded by costumed skiers rowdily celebrating another season at one of the greatest resorts in America. Check latest lift ticket pricing. Discounts for multi-day, beginner lifts and military passes are also available.